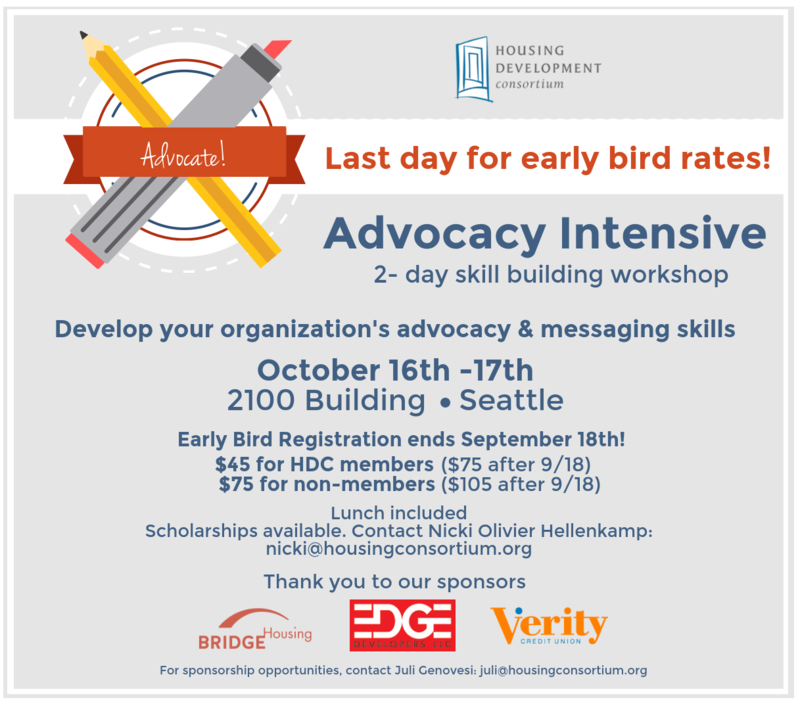 Today is the last day to secure early bird rates for our two-day Advocacy Intensive! Build your capacity for systems change work by enhancing your understanding of mobilization and organizing, housing policy and the political process, and how to engage with electeds. Save $30 by registering by midnight tonight! Speaking of deadlines, today is also the last day for HDC members to submit an application for Leadership Development Survey Course. The seven-month course gives participants a broad overview of leadership principles and exposes participants to the varied roles of leaders in mission and value-driven organizations. Who’s the mayor of Seattle? As of this writing, it’s Bruce Harrell. By this evening, perhaps Tim Burgess. Capitol Hill Housing announced plans to build LGBTQ- affirming housing for older adults. Kent cracks the top-10 for highest apartment rent hikes in the country. The City of Redmond is considering raising impact fee rates in 2018 to keep pace with inflation. You can help the Yes on Prop 1 Campaign to renew the Vets, Seniors, and Human Services levy! Tell us how the levy has impacted your personal or professional life or if you are representing an organization, Click here for an endorsement form and return it to our Government Relations & Policy Director by the end of the month. The Seattle Housing Authority will turn an old records storage facility near Yesler Terrace into about 125 affordable homes. Row houses at Yesler Terrace, the nation’s first racially-integrated housing project, will soon be replaced, but the memories and hamsters buried in the backyard remain. Seattle startup (and new HDC member) Blokable‘s modular construction model is attracting the attention of some high-profile investors. East King County electeds and King County Council representatives talked affordable housing at a panel discussion hosted by Leadership Eastside. Alleged “arch-nemeses” John Fox and Roger Valdez talk to KUOW about their different notions of how to meet the demand for affordable housing in Seattle. Short-term rental owners seem pretty amenable to Seattle’s proposed regulations on AirBnBs and VRBOs. Last week Seattle Mayoral Candidates Cary Moon and Jenny Durkan debated growth, housing affordability, and homelessness in a debate that anyone reading this email should watch. Here’s a full run-down by the event host Solid Ground.